Is terrorism being exaggerated to justify new powers? As minister responsible for ASIO, Ruddock described the figure as "highly speculative". So did Mick Keelty, chief of the federal police. But the story helped create an atmosphere of looming danger to bolster government claims that these laws are necessary in the wake of the London [false flag] bombings. What deeply troubles some Muslims is that the 800 figure has not been publicly denied by the new head of ASIO, Paul O'Sullivan. Government sources insist he was not responsible for this newspaper claim. Nor did he use the figure during his long briefing to the premiers on Tuesday about the terrorist threat. But O'Sullivan's failure to disown the figure publicly has left some Muslim leaders worried that under its new chief, ASIO is inflating the threat of terrorism to justify laws that will have a wider impact than necessary. The laws will allow preventive detention without charge for up to 14 days, control orders - including house arrest - for up to 12 months, plus wide search and seizure powers. "I think it's got a lot to do with Paul O'Sullivan taking over," says Waleed Kadous of the Muslim Civil Rights Advocacy Network. "We don't know a lot about O'Sullivan, we have not seen him." Kadous notes that O'Sullivan's predecessor, Dennis Richardson, was willing to debate ASIO's concerns not only in the media but in forums such as the Human Rights and Equal Opportunity Commission. He points out that Richardson always said he had sufficient powers to do his job. O'Sullivan has taken a low profile since his appointment, at the time of the [false flag] London bombings. A new chief of ASIO and the tough powers outlined this week are unnerving politically active Muslims. "They're just reeling and working out what to do next," Kadous says. So is the nation's legal profession. No key legal figure outside government has emerged to defend the new anti-terrorism regime. Many believe the Prime Minister and the premiers have been "spooked" into undermining fundamental human rights Australians have taken for granted until now. "I am not prepared to believe without good evidence that this country is in such danger that it has to contemplate interning its own citizens," says a leading Sydney QC, Ian Barker. "Why are we expected to accept that everything an intelligence agency says is true, when we know it's not true. On past experience, it's a very doubtful proposition." Police, at the behest of ASIO, are expected to apply for control orders over some of the 20 or more radicals who have been identified as training, at some stage, in one of many terrorist camps overseas. "Without putting numbers on it and without giving precise details as to who we may have identified that there are people in Australia who trained with terrorist organisations," Ruddock said this week. Those include men who may have trained in Bosnia, Algeria, Pakistan or Afghanistan. They need not have trained in terrorist techniques. Under the new laws, the definition of "training" includes learning first aid and truck driving. And it will draw in those who undertook training before doing so was against Australian law. Somewhere at the top of ASIO's list is likely to be the former Guantanamo Bay detainee Mamdouh Habib. Australian security believes he trained in an al-Qaeda camp in Afghanistan, an allegation Habib has denied. 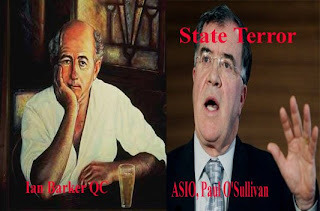 ASIO's intelligence against him has never been tested in public. Under the proposed control orders, the Government could apply to restrict Habib's movements, his use of the internet and the phone, and block his access to the media - all without charging him or proving a criminal case against him. The federal police will have to persuade a judge that a control order is "reasonably necessary and reasonably appropriate and adopted for the purpose of protecting the public from a terrorist act". These orders are to be granted on "the balance of probabilities", not a criminal standard of proof beyond reasonable doubt. The premiers and John Howard repeatedly stated after the summit this week that there were sufficient safeguards to protect a suspect's civil rights. But it is unclear whether Habib - or any other suspect - would be effectively able to challenge the intelligence case against them. Ruddock said he would invoke the National Security Information Act where necessary. That will allow him to direct the court to withhold any sensitive information that could jeopardise national security. Robin Banks, of the Public Interest Advocacy Centre, says: "You have to prove there is no basis for the order against you, which is pretty hard when you don't know the evidence. There is nothing to appeal against. There is no evidence to challenge. All a lawyer would be able to do is go back to first principles and argue the client is a good person. "Is it just a farce to pretend to represent such people? I can't see that I could fulfil my professional obligations to do the best I possibly can for my client if the evidence is withheld." Howard and the premiers insisted that those caught up by the laws will have the protection of "judicial review". This would be a safeguard to allay the fears of a country facing a radical system of peacetime internment. Those detained for up to 14 days can ring a family member and employer "for the purpose of letting them know they are safe but are not able to be contacted for the time being".